Was looking at buying one of the new packs or a Prime Titan, but when you click to buy the item, the Origin overlay pops up with this error. The product(s) you are attempting to purchase are invalid. Is this just me, or is no one able to currently purchase the new items? I have this issue also. I would like to give you more money respawn for this awesome game! Looks like console players are able to buy it, but I believe it's just not updated for the Origin store. My friend on PC is able to buy as well. I can't. Very frustrating. I'm also getting the "whoops" error. Tried exiting FRAPS, MSI Afterburner etc. Also repaired/reinstalled Titanfall 2. No dice so far. Same here. Also any chance we could also get the colours and patches individually, but obviously for a increase in price? I wonder how many times EA is going to mess stuff up for Titanfall... How long before the confluence of all of these problems becomes something that respawn can sue over? Thanks for the support! Appreciate you wanting to buy the new stuff. We're on it. ...No offense, but that's... kind of ...you know? |D A very weird bug that should really not be a thing. Especially if you want to.. ...earn money and all. on the bug thread it says it is now working. It still isn't. Store for PC should now be working for all regions. No luck for me, my money waits. Have an issue around this on PS4. My game is from US but I play on my EU account. Choosing the 'Store' gives me an error saying 'There is no content' here which is a problem as I already bought the two Primes using my US psn account. Is that content locked to the account Titanfall 2 was purchased on? This would be a first as the dlc from a few other games works fine no matter which account on my ps4 was being used. Yep, same here. All I want is a banner with a sloth hanging from a Ronin sword...is that too much to ask? @Gamb10r sorry for the issue and thanks for capturing. I'll report this over to the team. The store has been working on our end. @Gamb10r While we look into it make sure that Origin is up to date and do a restart. @cesarld make sure you have installed the pre-order content by pressing start on the game tile and going to manage game. Hey guys, I got mine to work. After turning on my pc origin started up. 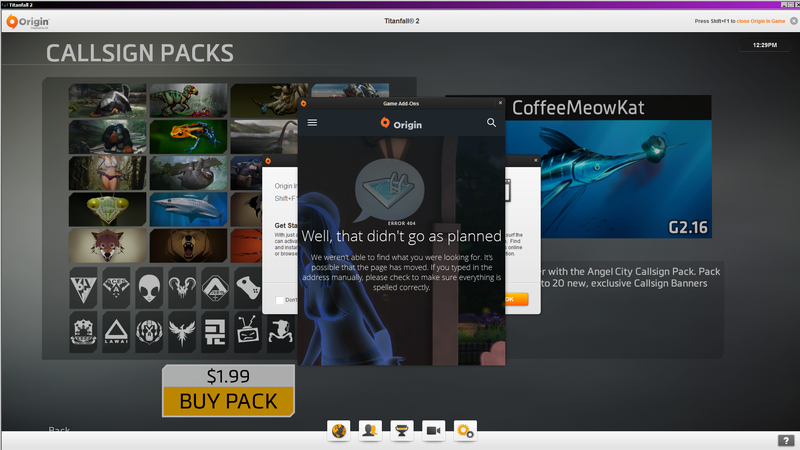 When origin was done opening for the first time I exited origin with the exit button in the tabs and then reopened origin. Steps put together also known as restarting and it worked. Thankyou Jayfresh for the helpful tip in your last post. Well, the error message is gone, but now I'm getting just a white empty window. Still can't purchase anything. Restarted Origin, repaired TF2, restarted my machine, etc. Still nada. @ChewyCinnamon glad to hear it! 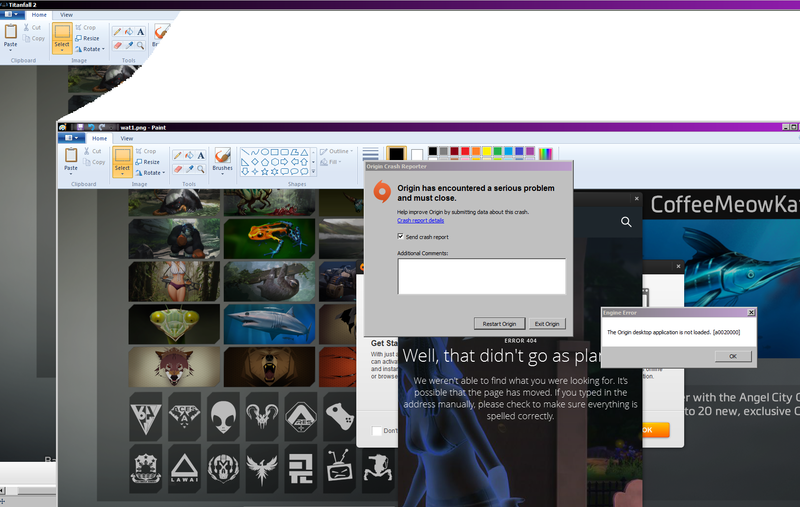 @AOD_TripFour make sure Origin is also up to date with latest version. I have restarted my machine. Both Orign and Titanfall 2 appear to be up to date. I was originally getting two white screens where one spawned the other. Now I am just getting the one white screen that @AOD_TripFour is getting. I would have bought all available content by now. Same Fixed. So I still get the first White Screen and then if I tab over to the Origin app, and hover over it, I can see the minimized window. I then say maximize and tada! That is weird. Glad it worked out but I'll let the team know about it. Thanks for the support!